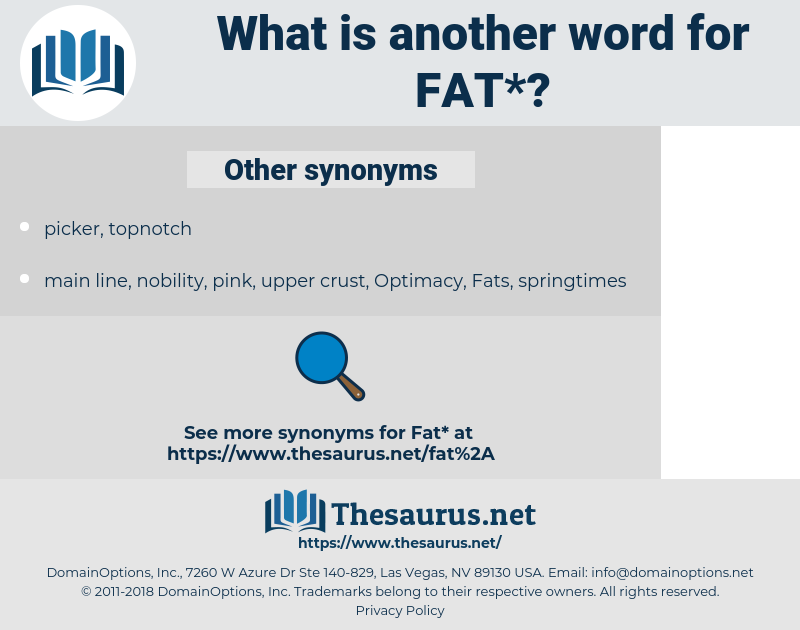 What is another word for fat? 1. 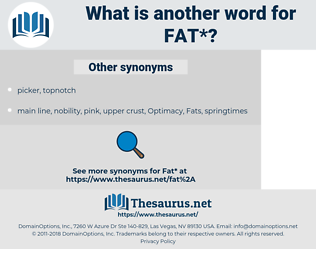 Obese, adipose, corpulent. 2. Oily, greasy. 3. A greasy, soft- solid material, found in animal tissues and many plants, composed of palmitin, stearin, and olein ( or a compound of glycerin with palmitic, stearic, and oleic acids) in varying proportions. FETA, oily, significant, bolded, bigeye, flabby, chubby, bigtime, huge, waxen, gigantic, substantial, tall. Criteria, Grasses, lipides, grease, GRAS. little, soft, miniature, slim, insignificant, small, skinny, unimportant, impoverished, lean, tiny, slender, slight, poor. ectomorphic, attenuate, underprivileged, Bankrupted, spindle-legged, compressed, unfavorable, smallish, inadequate, exhausted, Spindling, short, disadvantageous, wanting, slim-waisted, elongate, straitened, depressed, scarecrowish, attenuated, ruined, angular, drained, vacant, depleted, bottleneck, close, reduced, shortish, incomplete, insolvent, blank, unproductive, sinewy, condensed, stark, spindle-shanked, slender-waisted, unfertile, shrivelled, willowy, waspish, skint, hairlike, skimp, shallow, disadvantaged, indebted, insufficient, tightened, deficient, sunken-eyed, sylphlike, paper thin, impecunious, shriveled, constricted, low, deprived, dead, shy, contracted, empty, tight. necessity, scarcity, lack, want, need. But it looks quite big and fat now, only the colour is the same. But the large fat woman who opened the door gave her to understand that she had taken a liberty. faded, feed, fifth, fit, faith, fuddy-duddy, feat, feud, fete day, fatuity, fatwa, fade, fifty, fed, fda, faddy, Fatah, fifty-two, food, fiat, fate, foot, fitted out, fatwah, fahd, footed, FPD, fiftieth, foetid, fatty, fetid, Fatiha, fatheaded, fad, foodie, ft, Fatihah, fade out, fadeout, fated, fathead, fit out, fado, fad diet, Fet, fade away, FTO, fete. cocoa butter, myelin, leaf lard, edible fat, leaf fat, myeline, animal fat, polyunsaturated fat, medulla.